Old traditional stone farmhouse completely renovated with care and harmoniously immersed in the green hills of Reggio Emilia. Splendid the landscape of the mountain peaks of the Reggio Emilia and Modena mountains, in the lands of Matilde di Canossa, with a splendid view of the Bismantova stone, mentioned by Dante in the Divine Comedy. With access on a private white road of about 300 meters closed, it is located in five hectares of indigenous woods and meadows and is the ideal place to spend moments of relaxation and tranquility surrounded by beautiful nature. Great for families and groups of friends, offers the opportunity to spend unforgettable holidays. A beautiful billiard table is available to guests. In the warm season you can dine al'aperto in the 'large dining area equipped with stone barbecue and large garden. 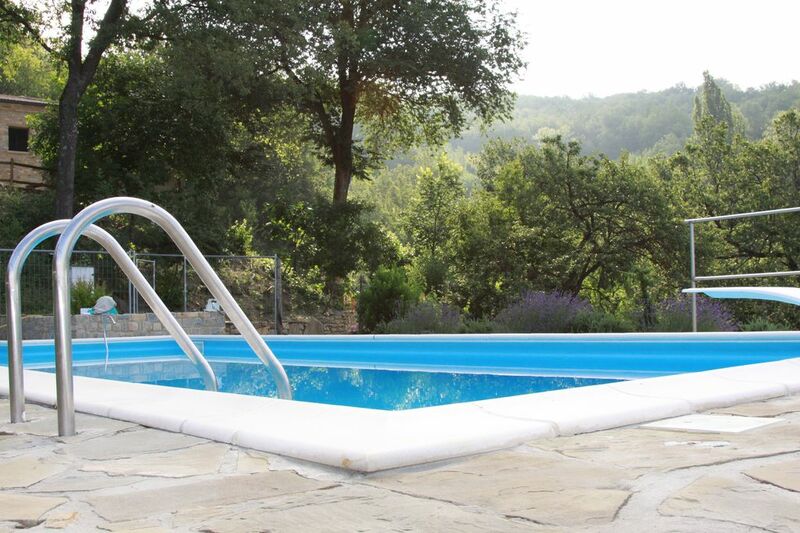 The beautiful swimming pool (open from April 28 to September 15) solar heating is built on a hilltop and surrounded by lush vegetation enjoys a splendid panoramic view of the valley and the surrounding countryside. In the small village of Valestra, about 2 km away, you can taste and if you want to buy the best Parmigiano Reggiano of Italy, in fact the Case San Pietro di Valestra won in January 2018 the first prize as best Italian Parmigiano Reggiano. He also ranked in fifth place worldwide in an international competition of the best cheeses, which took place in London in December 2017.
the chairlift that rises from Rescadore to an altitude of 2 thousand meters on the slopes of Cusna has brought thousands of people to the Apennine area. for an unforgettable experience. The trail of lights along the slopes of the Cusna is really impressive and the view of the sea and the Po Valley shivering.